SPECIAL PRICING ON PRENUPTIALS in 2019! SPECIAL PRICING ON PRENUPTIAL AGREEMENTS DURING THE SPRING OF 2019, TO ACCOMMODATE SUMMER WEDDING PLANNERS. I am very sad to get the news about the death of 81-year old Attorney Joseph Wishnow. 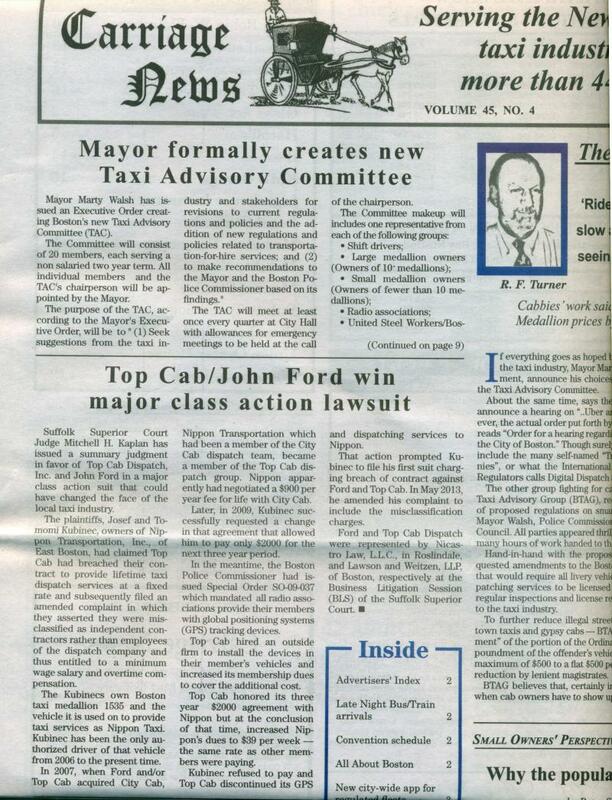 He was a real pillar and support to the individual taxi drivers and the taxi industry for many decades. We will all miss him and his presence. It is so hard to watch the great members of his generation pass on. They, like Attorney Wishnow, were from a better time and place and brought inspiring values to us all. We must celebrate his life as he made the world a better place for those whose lives he touched. My condolences also to my colleague, his amazing daughter Attorney Robin Fleischer, who he inspired and loved and who follows in his footsteps! Those who sign up for our email listing will receive periodic copies of our Newsletter as they are generated. They will also receive in their email certain promotional offers and discounts on features running at the time of printing. We also will include certain Notices with regard to changes in the law and other information you may find useful. SPECIAL OFFERS UNTIL June 30, 2019. Currently NICASTRO LAW, L.L.C., is promoting a Senior Discount, which gives seniors a 20% discount on completed legal services. This discount is running for a limited time, until June 30, 2019. This cannot be combined with any other offers. A Senior would be considered to be age 65 or older. Simple Wills are currently starting at $395 for a limited time only. Expiration is June 30, 2019. This offer cannot be combined with any other offers or discounts. This does not apply to the more complex estate planning Will or Pour Over Will. This does not apply to specific bequests and legacies. This applies only to the simple will. This page is designed for our readers who would like to hear about our firm news, special promotions, and updates; and for those who would like to give us their email address so they can receive informational emails and newsletters as they are generated. Please fill in the informational form on the right to receive our newsletter, promotional materials, and notices. Please include your name and other contact information so we can share with you information about legal products that you may find helpful. You should know that we do not share the names of persons on our list with any person or any business or otherwise. We keep all of your information confidential. 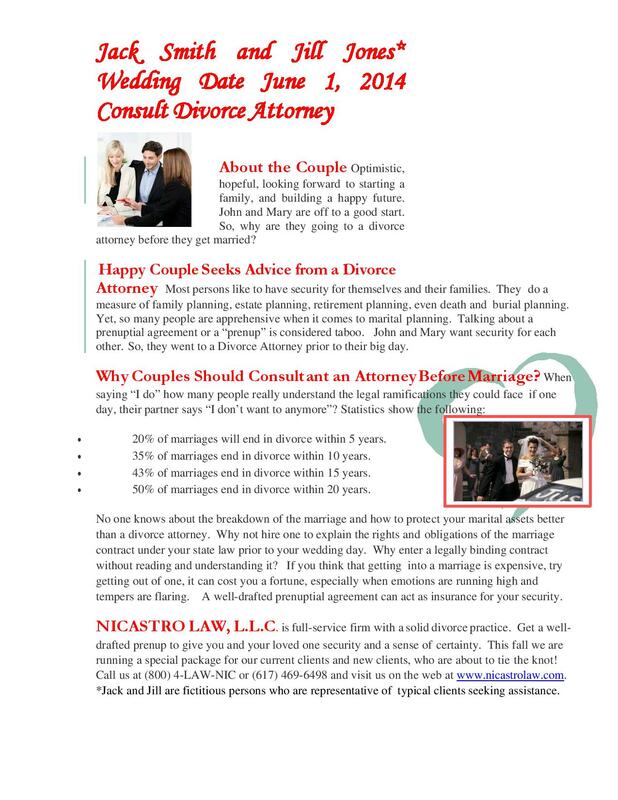 Further, by giving us your email address, and other information, you do not become a client of NICASTRO LAW, L.L.C.